Azure Automation provides the ability to automate, configure, and deploy updates across your hybrid environment using serverless automation. These capabilities are now generally available for all customers. Get an inventory of operating system resources including installed applications and other configuration items. Get update compliance and deploy required fixes for Windows and Linux systems across hybrid environments. Track changes across services, daemons, software, registry, and files to promptly investigate issues. These additional capabilities are now available from the Azure Resource Manager virtual machine (VM) experience as well as from the Automation account when managing at scale within the Azure portal. 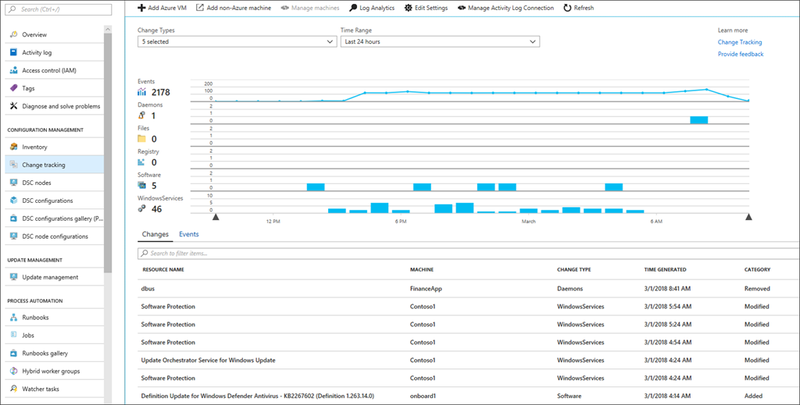 Integration with virtual machines enables update management, inventory, and change tracking for Windows and Linux computers directly from the VM blade. To enable management of your Azure and on-premises resources at scale, these capabilities have also been added to the Automation service in Azure. You can get a unified view across your entire environment and can take action to ensure these are correctly configured, updated, and managed from the Azure portal. To get started with the new capabilities from Automation, use the virtual machine blade or the Automation account when performing tasks at scale. Learn about the existing and new features on the Azure Automation documentation pages, and follow Azure Automation on Twitter.